ROAD TOWN, Tortola, VI – Central American and Caribbean Games (CAC) Long Jump Gold Medal winner, Virgin Islander Chantel Malone will be honoured today, Friday December 19, 2014, with a Motorcade and also a Ceremony of recognition for her achievement at the Administration Complex. Malone leapt to CAC Long Jump Gold in Veracruz, Mexico, on Tuesday November 25, 2014, to become the first Athlete from the OECS to win the competition, which also marked four consecutive CAC Championships that the BVI had won Gold. The Motorcade will commence from the Festival Grounds at 3.30pm and take a tour around Road Town before proceeding to the Central Administration Complex where there will be the honour ceremony at 4:30 in the Breeze Way at the Administration Complex. All Family, Friends and Fans are being asked to join in the motorcade, line the streets, wave flags and join in the celebration of the accomplishments of the Virgin Islands Sports Ambassador. 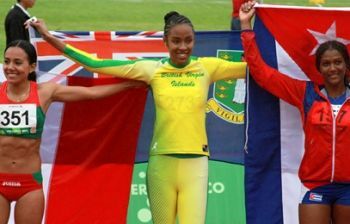 In yet another golden moment for the Territory, Malone extended the Virgin Islands’ Central American and Caribbean Games’ gold medal streak to four straight when she landed at the top of the Long Jump pile in Xalapa, Mexico, during the 22nd edition of the event. She also became the first in a field event after three medals in the short sprint. Malone who narrowly missed a medal and settled for fourth in the Commonwealth Games in Glasgow, Scotland over the summer, seized the lead for good from Cuba’s Irisdaymi Herrera in the third round with the winning leap of 6.46m as the Cuban did not better her opening 6.32m mark until her last attempt when she cut the sand at 6.36m to claim silver. Well deserved! Congrats again Chantel, and thanks to those who have organised this vent.